Caleb just turned 2 years old last month and has recently grown out of the baby wearing stage. I miss wearing my baby already! So while reminiscing on those cuddly times, I thought I would share my favorite baby carriers with you. As a first time mom, I wanted to be prepared, especially in the baby wearing department. So while I was pregnant, I talked to some mom friends & did some research. Then I went to Zoolikins and tried on the ones that interested me. The lady was so helpful and answered all my questions. I decided on the Beco Ring Sling and the Lillebaby Complete. 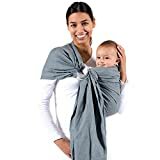 Turns out I could not use the Beco Ring Sling at all because at the time I had severe carpal tunnel and the material was too thick and new to slide through the ring easily, despite being washed several times. A friend is breaking it in for me now so maybe I’ll try it again with the next baby! 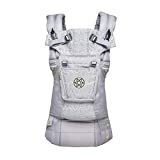 So I purchased the Baby K’tan Cotton Wrap Style Baby Carrier and LOVED it from the get go. This soft carrier is really easy to use! No long material to get lost in and no actual wrapping. Just slip it on, put your baby in and off you go! Baby is comfy and kissable. You could have baby facing you, facing outward or to the side. You can nurse in the K’tan as well. Once Caleb had gained some weight I used the Lillebaby Complete. This is an awesome carrier for bigger and older babies. You can use in 6 different positions and it has lumbar support. My favorite positions were front, side & back carry. You can nurse in this one as well simply by adjusting the straps to lower the baby in the front position. Very convenient when your babe is hungry and you’re out & about! This carrier is very durable and easy to use. Once the carrier is set to your carry style, & baby is in, it just has two buckles to secure. There are so many helpful YouTube videos put out by mamas who can show you every which way you can use these great carriers. Are you a new mom and looking for the right carrier? Let me know if I can answer any questions for you. Pro mama-what is your favorite baby carrier & why? Loving the ring sling and K'tans.